The 2012 Haskins Medal was presented to Richard William Pfaff for his magnum opus, The Liturgy in Medieval England: A History (Cambridge: Cambridge University Press, 2009). 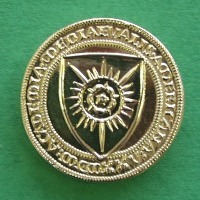 The committee wrote that this work “represents the sum of a life’s work dedicated to the recovery and analysis of the sources for the first comprehensive account of the liturgy in medieval England, from early Anglo-Saxon origins right up until the Reformation.” President Alice-Mary Talbot presented Prof. Pfaff with the gold medal, which was designed in 1939 by Graham Carey. Jeffrey F. Hamburger (Chair), Dyan H. Elliott, and Jennifer Summit served on the 2012 committee. Christopher MacEvitt, associate professor in the Department of Religion at Dartmouth College, was the recipient of the John Nicholas Brown Prize for 2012 for his work, The Crusades and the Christian World of the East: Rough Tolerance (Philadelphia: University of Pennsylvania Press, 2009), which successfully introduces a new paradigm for the relations of the crusaders with indigenous Christians in the twelfth-century Levant. The committee for 2012 included Robert Nelson (Chair), Sara Lipton, and Paolo Squatriti. President Alice-Mary Talbot presented the award. Lee Manion was awarded the 2012 Van Courtlandt Elliott Prize for his article “The Loss of the Holy Land and Sir Isumbras: Literary Contributions to Fourteenth-Century Crusade Discourse,” Speculum 85 (2010): 65-90. Deborah Deliyannis, chair of the selection committee, presented the award to Dr. Manion, assistant professor of English at Stern College for Women. His study “stood out for its interdisciplinary range, and for the implications of his conclusions that crusading ideals permeated late-medieval culture far beyond clerical and military circles.” Joel Kaye and Deborah McGrady also served on this committee. The Student Travel Fund Bursary made grants to six graduate students who presented papers at the Annual Meeting: Samantha Katz (Yale), Andrew Kraebel (Yale), Brendan Sullivan (NYU), Kristine Tanton (USC), Bridget Whearty (Stanford) and Barbara Zimbalist (UC Davis).